Doesn’t time fly! It feels like only yesterday we were at WTCE 2017 and life has been getting busier and busier here at Amenities. As the industry is preparing for WTCE we are delighted to share our April 2018 Issue which will be distributed at the exhibition as a media sponsor. You can also get your hands on a copy at The TravelPlus Airline Amenity Bag Awards being held at its new exciting venue; The Bucerius Law School. It seems only fitting that with the on-going debate of gender diversity being the ‘in topic’ at the moment, this issue focuses on ‘Women in Aviation’. We discuss the gender imbalance amongst airline executives and how this could be affecting their amenity offerings, what women want and how the evolution of demographics could be the catalyst of a massive shift in the industry. Also, we ask the question; What responsibility do airlines have when it comes to providing children’s kits that both delight and entertain without making influential choices on gender stereotyping? I’d like to thank all our clients especially those ladies who have helped in shaping this spring’s issue ‘Women in Aviation’. My team and I hope that you all have a successful WTCE and look forward to seeing many of you there. Published by TravelPlus, Red Kite Studio, Littleworth Road, Burnham, Buckinghamshire SL1 8PQ. In this issue... IN THE SPOTLIGHT Amenities talks with The Airline Industry’s very own Wonder Woman: Linda Celestino; Vice President of Guest Experience & Delivery at Etihad Airways. THIS IS A MAN’S WORLD? With predominantly male airline executives, how does this affect both the tender process and the final amenity offering? 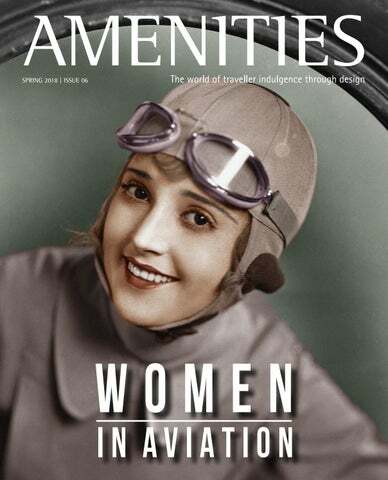 WOMEN TO WATCH Amenities celebrates some of the inspirational women forging ahead in the world of Aviation. WHAT WOMEN WANT! With the demographic of business travellers evolving, it’s time for airlines to start looking at their Business Class offerings and ask themselves; What do Women Want? When it comes to providing amenity kits that both delight and entertain children on-board, do airlines have a responsibility to do so without making influential choices on gender stereotyping? WHY YOU SHOULD VISIT OUR STAND Amenities takes a closer look at who will be exhibiting their new amenity concepts and offerings at this year’s 2018 WTCE. amenity kits. They were inspired by the authentic decoration that can be found in various areas of Austrian life ranging from historic rooms from the imperial area to fabric patterns, gardens and blacksmithing. The special pinch of traditional hospitality, Austrian charm, and royal identity can now be found in three amenity kit varieties. 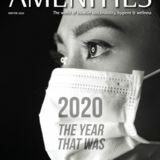 We get to know SPIRIANT’S General Manager of Amenity Kits, Angie Fung, and her thoughts on the current amenity market. The outbound amenity kits come in an elegant material mix and a sophisticated style: The leaner pouch is sleek with a satin velour surface. Matching the cabin’s color, red design elements have been added subtly to the amenity kits. Both pouches are equipped with an eye mask - which is also made of the velour fabric -, socks, ear plugs, a tooth brush and tooth paste, as well as cosmetic items by WienerBlut. A popular brand that creates fragrances and products based on original formulas and fads of 19th century Vienna. AMENITIES LIBRARY Presents an elegant way to search and compare airline amenity kits. Copyright © TravelPlus Media Limited, 4 The Arcade, Front Street, Tynemouth, NE30 4BS. Printed in the UK by Principal Colour Ltd. All right reserved. Reproduction in whole or part without written permission is strictly prohibited. The title Amenities is published twice a year and is a trading division of TravelPlus Media Limited. While every effort has been made to ensure that the information is correct, neither the author nor publisher can be held responsible for inadvertent inaccuracies or omissions. The views of the writers in Amenities are not necessarily share by the publisher. AK-Service introduces new Business Class amenity kits for Uzbekistan Airways Uzbekistan Airways have partnered with AK Service to launch their new luxury amenity kits for business class passengers that aim to be both compact and full of useful stylish items. These kits are the beginning of a collaboration with Uzbekistan Airways and will be followed by a new series in iconic ethnic prints and fabrics. The collection was designed to reach the needs of business class passengers, provide the ultimate combination of comfort, functionality and aesthetic pleasure that can be reused post-flight. On long-haul flights, Business passengers receive a travel zip closured pouch, carefully selected treatments by Caudalie (luxurious lip balm and hand cream), a dental kit, an eye mask, cozy slippers, ear plugs, a shoe horn, a comb and a pen. Available in herringbone designer fabric with blue accents, the kit is inspired by eternal beauty and power of Uzbek cotton boxes symbolizing the wealth of the country. Parents’ Favorite Products Awarded to Saudia! Saudia Airlines have been recognized with the “Parents’ Favorite Products” Award at the International Tillywig Toy Awards for its onboard children’s kits. The travel kits feature Disney’s Tsum Tsum and their beloved characters, bringing fun and excitement to children inflight. The “Parents’ Favorite Products” award recognizes children’s products that enhance the quality and playfulness of daily life. The review process involves assessing entertainment and educational value, quality, fun factor, creativity, and if the product encourages new ways of thinking or promotes physical development. Saudia’s Disney Tsum Tsum kits are tech focused and packed full of multifunctional products, including tactile activities and keepsake products. The kits include a variety of activities such as a tech stand, stickers, a game board, drawing board, magic sketcher for drawing, and origami sheets for varying skills levels. FORMIA and Turkish Airlines release Captain Kangal children’s toy FORMIA and Turkish Airlines aim to educate and entertain young passengers with the Captain Kangal children’s amenity kit. This kit features a sustainable plush toy that is re-imagined from Turkish Airlines’ original iconic children’s character. Outfitted in a traditional pilot jacket and goggle head gear, Captain Kangal represents the guardian dog of protection originating from the Sivas province of Turkey and known for its loyalty and gentleness with small children. The eco-friendly kit is created from sustainable materials and packaged in a reusable canvas bag, designed to deliver an exciting and educational onboard experience while integrating Turkish Airline’s sustainability directive – to leave a cleaner world for future generations. Hong Kong Airlines introduce new Business Class collectable kits Designed by local design house Ricebowl Republic the bags feature iconic symbols of Hong Kong: the birdcage, the teapot, the rice bowl and the Hong Kong city skyline, representing different facets of Hong Kong heritage and culture and accompanied by witty captions. Supplied by CLIP, the four bags are made from quality thick cotton canvas with a natural touch while the starkcolored lining creates a surprising contrast. These kits are a token of the airlines commitment to celebrating the specific local culture of Hong Kong. The inner items: socks, eyeshade and earplug pillow pack are all designed along the same lines. The kits come with LâOccitane products. SWISS partners with Victorinox The new collection for Swiss Business Class is a product of the collaboration between Swiss International Air Lines and Victorinox, and features a range of amenity kits in a multifunctional design. Business Class travellers on SWISS long-haul services can now enjoy a new line of amenity kits. Its designs have been developed in collaboration with Victorinox, the renowned manufacturer of Swiss pocket knives. A total of six different kits have been created in all, which will be offered onboard at differing periods. The collection has been specifically designed so that all the kits are reusable and can partially be combined. The collection includes a practical passport holder, a travel toiletries bag with inner pockets and a longer bag with an inner pocket. On long- haul flights to Switzerland, Business Class travellers will be offered a high-quality metal tin that is modelled on the Victorinox suitcase design. Every kit contains a toothbrush and toothpaste, a lip salve, a sleep mask, socks and earplugs. In the Spotlight With this issue focusing on women in aviation, we were delighted to have the opportunity to quiz Linda Celestino, Vice President of Guest Experience & Delivery at Etihad Airways. With over 32 years of experience from cabin crew member to now a lady at the top of the ladder, whilst also being a mother of five, she is without a doubt the airline industryâ&#x20AC;&#x2122;s very own wonderwoman. What does your present job entail? As Vice President of Guest Experience & Delivery, I lead and manage the division that is responsible for the entire guest journey and all guest touchpoints from start to finish. From the moment a guest decides to book their tickets online or makes their initial enquiry via the contact centre, to the time they check-in at the airport, the entire inflight experience and all the way through to the moment they land at their final destination and collect their baggage. Throughout this entire journey, we aim to deliver the best experiences for all of our guests, every step of the way. of Vice President of Guest Services at Etihad Airways and recently transitioned from that role to my current one, which is now Vice President of Guest Experience & Delivery. The culmination of my entire career - in one role! Work-life balance? When I work that out I’ll be writing that book! As a mother of five, I strive for balance to ensure the many hats I wear don’t fall off! The reality is many women in executive roles still feel guilty for not achieving it all and continually struggle to work out that perfect work-life balance. That balance isn’t necessarily equal with the two sides achieving equal weight. Some days the balance shifts according to what’s happening in my organization and work life or what’s happening at home. There is a constant ebb and flow and you need to create your own definition of balance. Only 5% of airline CEO’s are women. What role can airlines play in improving the gender equality gap? It’s true, most other industries have forged ahead in improving the gender equality gap. The good news is that the approach globally is moving forward, and the wider aviation industry has to catch up eventually – even if there has been little change in the past few years. I am optimistic about the slow but sure increase of women in the airlines’ executive ranks, and see this as a measure of success. We have a long way to go, but the future really is brighter than when I started my career. What are the challenges of working as a female in the industry across the board? We women who take the steps to venture into male dominated industries often face a variety of challenges such as a lack of support, lower income, a misguided perception of incompetence and overall lack of voice. successes. Our social media platforms have seen a spike in followers given our strong partnerships with popular Emiratis in the community that have a large following and appealing content. Together our messaging is succinct and compelling, encouraging new guests to fly with us and in turn becoming advocates for our brand. The aviation industry is ever moving, ever changing and competition for roles at the top is fierce. It feels as though the changes are occurring slowly, however I am pleased to see positive steps within my own airline taking place: increased networking options, senior execs being open to dialogue and creating the space to have the right conversations whilst challenging the norm. With the increased fluidity of movement, how will airlines through innovation tackle the on-demand service that is now expected from the passenger, from cabin interiors and the aircraft, to the amenity kits and in-flight entertainment? When it comes to amenity kits, the majority of those deciding on amenities are male, how can airlines ensure that their final offering is accessible across genders? Etihad already offers 1000+ hours of on-demand entertainment across our fleet. On our state of the art IFE platform, guests have the ability to create customized audio and video playlists; as an example, on our flagship 787 Dreamliner and a380 fleet, the Panasonic EX3 platform is customized to enable guests to filter unwanted genres. Regardless of whether the committee or team that decides on the amenities is comprised mainly of male or female executives, I believe the ultimate aim is to please the guest. Considerable resources are invested into understanding our guests, including the extensive face-to-face time our front-line staff and crew have with guests. It is this in-depth understanding of our brand, our guests and our customer philosophy that drives our decision making. The roadmap in the near future will see the introduction of a companion app that supports a second screen experience and further personalization. Additionally, the IFE platform will soon extend the experience for the guest beyond entertainment and into self-service channels enabling activities such as inflight ordering, digital publications and access to a variety of partnership-based products & services. The IFE platform, along with the mobile companion app, will be a key data collection tool allowing us to gather greater guest behavior insights. This will allow us to provide more relevant choices, from the types of TV shows and movies guests prefer to the type of ancillary products a guest would be most likely to purchase. The future of this platform is within the wider connected cabin concept that enables further data collection from sensors and facial recognition technologies. Our product and service teams focus on ensuring complete alignment across all touchpoints of the guest journey. Every element of the customer experience is looked at from colors, materials and even up to the notes contained within the air freshener. The team relies heavily on market research and focus groups with our guests. A few of our products have evolved to serve a dual purpose – a great example is our First Class amenity kit that can also be used as a tablet case, extending the experience onboard to the ground and effectively, everyday life. A common thread in the industry is the discussion of consumerising passenger data to create a far more personalised experience. What are your thoughts on this? Personalisation is really the logical end state of a segmentation strategy which we have pursued for many years. The difference is that technology will allow us to make those segments – ‘tailored offerings based on sensitivities’ - even smaller. That is because the amount of data and the capability of ‘rules engines’ (powered by machine learning) allow us to be more precise about targeting. But tech also drives automation allowing us to deliver many offers on the same plane. Without automation that would be impractical for our front line staff, especially onboard crew. Linda’s Favourites What is your favorite City? So hard to choose! but if I had to – Sydney, my beautiful hometown, followed closely by Amsterdam....oh those canals! Where is your favorite holiday destination? Aspen - snowboarding with my kids! Do you have a best onboard tipple? Piper Heidsick, of course, or San Pellegrino, depending on the time of day. What is your favorite on-board product? It has to be Wi-Fi and live TV, for all the wrong, or right, reasons – so I can work, check emails and stay connected with the world. What is your best holiday read? Anything non-fiction! Real life is way more interesting. I am an autobiography fan, being invited to walk the steps of someone else’s life experience is the best read ever. This is A MAN’S WORLD? Every airline strives for the perfect amenity offering from functionality and content through to design and branding. However, here at Amenities, one question has alluded us for some time. With predominantly male airline executives, how does this affect both the tender process and the final amenity offering? ndoubtedly, it’s a sticky subject and I can assure you, we have no intention of bringing out our pitchforks and man shackles, however, due to the present climate, we felt it was the opportune time to ask the women of the industry their thoughts. who travel, travelling for business. Surely airlines have a responsibility to reflect this evolving demographic of passengers within their executive team making those vital decisions on functionality, content, design and brands for their amenity offering? When it comes to Business Class, if an airline has primarily male passengers, it makes sense to offer unisex kits. However, said ‘Unisex’ kits are, more often than not, of a more masculine nature. While we’re on the subject of technology, social media marketing has become one of the biggest tools for digital communication strategies within global businesses, with social media ad expenditure accounting for 34.5% of global digital ad spend in 2017. As Angie Fung affirms, ‘It’s exciting times with technology and we should never underestimate the power of social media platforms. So many airlines are offering Wi-Fi onboard, which creates a whole new platform for airlines, brands and advertisers.’ Amongst industry professionals, this has been a given for some time, however understanding your audience on these platforms will be key to telling your brands story. With a shift in gender roles needs to come the shift of representation of women and men in airline advertising. Representing women as the successful business man’s wife is unengaging and, If anything, one dimensional and a little archaic. Women to Watch With very few women in executive roles within the industry and fewer than 5% female airline CEO’s, Amenities thought a celebration was in order of some of the inspirational women forging ahead within diverse areas of the aviation industry. What in your view has been your biggest/ proudest accomplishment within the industry? : My biggest accomplishment has been the program launch of our Casper bedding line. It actually started out with Casper reaching out to me on LinkedIn (we’ve joked about needing to tell LinkedIn this story). We kicked off the program development with Casper and it turned into something that we knew was going to be an amazing collaboration. We once ran 5 miles around LAX TBIT with the designers at Casper, climbing on and off aircraft, measuring seats, and cutting fabric. We did countless fit checks and tested the product inflight with customers. We launched 9 new products with Casper on Dec 5, 2017 spanning 60 stations both domestic and international. It was a team effort across American, our manufacturer (WESSCO INTL), Casper, and our distributor (MLCo). Since launch, we’ve arranged the donation of tens of thousands of pillows and blankets to homeless shelters and charities across the US and internationally. Job description: Multi-tasker. How long have you worked within the aviation industry? : Since 1999 - almost 20 years. What in your view has been your biggest/ proudest accomplishment within the industry? : That’s a tough one! I’m fortunate that I’ve had many proud moments. But if I have to choose one, then it would be when CLIP won the Best Equipment Onboard for Passengers with Onboard Hospitality in 2017 with the SWISS BENTO BOX! This event was extra special because CLIP was founded only 1.5 years before, SWISS was our first client and it was an Industry Recognition for our Design and Innovation. Job description: Interpreting brands to create designs for amenity kits and comfort Items on airlines. How long have you worked within the aviation industry? : 3.5 years. What in your view has been your biggest/ proudest accomplishment within the industry? : Having designs that I have interpreted for International luxury brands placed with leading airlines worldwide. Job description: Leading different projects such as cabin interior projects, in-flight and ground projects, onboard publications and IFE content and asset management development. I’ve been working in aviation for 12 years, starting my career as a flight attendant in 2006. What in your view has been your biggest/ proudest accomplishment within the industry? : I have always been compassionate and responsive to passengers to make sure customer satisfaction is achieved. Air Astana has been recognized for 4 Star service excellence, retaining the accolade of ‘Best Airline in Central Asia and India’ in the Skytrax World Airline Awards for the sixth consecutive year! I am proud to have been a part of it and that pride is the source of my energy and commitment to the company value. How long have you worked within the aviation industry? : Thirteen years ago, while I was in charge of the Promotional Items Activity at Alcan Packaging I took up the challenge to capitalize on our industrial expertise and strong know-how in the design and manufacture of bags and accessories to expand our business model to the aviation industry. What in your view has been your biggest/ proudest accomplishment within the industry? : My biggest accomplishment has been to enter a very challenged and mature market and to be recognized as part of the major actors able to bring a singular and valuable contribution. One of our biggest challenges is to imagine the perfect kit: the one that fits the overall concept as well as the sharp budget while being trendy, using innovative fabrics and high-quality materials. Thanks to the agility and the flexibility of my team who sees things through customer eyes and goes beyond their needs, I’m proud to have built a long standing relationships with our airlines customers. How long have you worked within the aviation industry? : I have celebrated my 6 year anniversary in the company this January 2018. It is my first job since leaving University and I am so happy to be a part of this industry because I am finding it very interesting and so varied. This variety can help open so many doors within the aviation world. What in your view has been your biggest/ proudest accomplishment within the industry? : It is hard to say one exact thing as every little step was important for me in that particular moment. Job description: I am responsible for product development and in charge of the Marketing team where we create all our amenity kits. I am also involved in sales and working as the client manager for our main clients, so I can better understand what they need. Plus my job includes building relationships with brands and communication with potential partners. There are so many responsibilities but it is this that makes it so interesting and I guess it is the combination of hard work, traveling and communication that suits me as a work-aholic! Job description: Building relationships with considered global brands in order to match them with our airline customers. From my first signed contract with the client to my first license contract with the brand etc. All of these were very significant and will always stay in my memory. I hope that over the last few years our company has become more known in the international market. We’ve received recognition from new clients and other market players, we’ve also started to work with famous fashion and cosmetic brands and we are developing our portfolio every year. AK has gained a few awards (TravelPlus) which we are very proud of and of course we’ve gained new clients and extended relationships with our current ones. What women want! With the evolution of the #MeToo and #TimesUp movements, never has gender been such a divisive issue. It’s no surprise with the progression of gender roles and female empowerment, that, as Jennifer Green from Wessco International highlights ‘it’s clear more business women are flying and overall demographics are changing.’ Now is the time for airlines to start looking at their Business Class offerings and ask themselves WHAT DO WOMEN WANT? n Economy Class the kits are nearly always unisex. This makes sense, due to the tight budget constraints placed upon suppliers when it comes to designing these amenities. However, in Business Class there is a divide. Some airlines are choosing to offer gender specific Male and Female Amenity bags, with others sticking to a Unisex offering. However, are either really fulfilling their purpose? Unfortunately, the unisex kits are often very masculine in design and content, and although the demographic of Business Class travellers is still predominantly male, the number of women in board positions of global companies is on the rise, and so in the long term the unisex kits may end up being unfit for purpose in their current form. Attend the leading global event for travel catering, onboard retail and passenger comfort… Don’t miss the opportunity to source the latest products and services from over 350 international suppliers. Network with 3,700 onboard professionals including 800 airline and rail buyers and be inspired by thought provoking presentations and demonstrations. A Supplier’s Story with Angie Fung Amenities gets to know SPIRIANT’s General Manager of Amenity Kits, Angie Fung, and her thoughts on all things amenities. Having worked in the industry for over 20 years, with previous experience working for brands such as Hugo Boss and Calvin Klein, who better to talk to when it comes to the current market. What inspired you to work in the amenity industry? I’ve been in the airline industry for almost 20 years and my journey to amenities has been a natural evolution. It really started before airlines, where my previous focus was in the development of toiletry bags and gifts for the fragrance and skincare industry. I worked with brands like Hugo Boss and Calvin Klein and discovered that I found the full process of product conceptualization, sampling, production, all leading up to the final reveal incredibly rewarding. I took a leap and found my home in the airline industry, where I’ve been involved in all product segments in one form or another; comfort items, meal service, crew & service; you name it, I’ve done it. When the opportunity arose at SPIRIANT for a brand new set-up of a dedicated Amenity Kits Business Unit, I jumped at the opportunity. What has been the most significant shift in the industry since starting your career? There have been tremendous changes over 20 years. Back then, there was less competition and the airline industry was still a bit of a mystery to most. I remember exhibiting at IFCA, in a tiny exhibition hall with a handful of suppliers. Competition wasn’t as fierce as it is nowadays, but the good thing about competition is that it propels suppliers to strive to be better. Obviously, tech advancements have had a huge effect on visibility these days, with information easily accessible to everyone, which gives us an amazing platform for product launches, communication and developments. What is the biggest challenge the amenity industry faces in the current market? Aligning airlines with the perfect brand is crucial. It’s so important to get it right, finding an offering that ticks all the boxes and has the wow factor. It’s simply not enough to offer visual appeal, it has to be powerful enough to take home into their day-to-day life. That’s when an amenity kit has been truly successful! It’s becoming commonplace for airlines to offer branded kits, so it takes a bundle of expertise, knowledge and creative flair to overcome that challenge. What excites you most about the amenity industry at present? For me, it’s always the challenges that excite me. Discovering a new brand, developing the next ‘wow’ kit, embracing new materials and trends; it’s all about jumping over a hurdle to creating something new, inspiring and game changing for the airline. With the world evolving as quickly as it is now, having a clear vision for next steps is vital. You cannot challenge yourself if you’re not stepping into uncharted territory! What would be your ideal tender? My ideal tender is working jointly together with airlines on developments, perhaps in the form of workshops to design the kit as a team. There’s such immense satisfaction in the airline being an integral part of the creative process, simply because they can experience the excitement of product evolution. Is there anything you would change or perhaps do differently in the industry? How this industry has evolved over the years is mainly because of the changing business environment, both for the airline and also the suppliers. For example, market forces, the economy and trends in consumer preferences dictate many of the decisions made and ultimately the final product offering. I’ve given in to the fact that it’s impossible to change the inevitable and learned to embrace it to our advantage instead. Premium economy appears to be a quickly growing market, how will suppliers provide airlines with longlasting solutions to tackle the ondemand service that is now expected from the passenger, from cabin interiors and the aircraft, to the amenity kits and Inflight entertainment? PEY is a growing market and some airlines are still discovering who these passengers actually are. It’s often a consideration of ‘is our PEY offering a downgrade of Business or an upgrade of Economy?’ I truly believe that it’s individual to the airline’s needs. It’s not simply a case of the product offering, you need to look at the whole PEY concept as a whole – especially where the ticket pricing plays such an important part of how the airline tailors the concepts and products around that. It’s not a one-size-fits-all approach, which is where working with a supplier who understands how to expertly explore the route is a must. It’s about finding a solution that’s perfect for a specific airline or region. For example, our kit for Asiana Airlines included a luxurious pair of slippers that passengers can simply slip into and have instant comfort. This takes into account the significance of slippers to Korean culture. How do you think the growing trend of Gender neutrality will affect Airline Amenity Offerings? Very simply put, the needs of men and women are different. An amenity kit’s purpose becomes pointless if there’s a random bunch of toiletries and cosmetics that aren’t useful or interesting to the passenger. It just becomes watered down. For example, men might need a shaver and cream, but women desire make-up remover wipes to freshen up. It’s a challenge to accommodate both. Our approach is to focus specifically on the acceptability and functionality of the product. For instance, replacing a facial moisturizer in a tube, which is often considered as a product for women, with a facial spray is a subtle switch to make the kit more gender neutral. Another example would be to change the make-up remover wipes to a facial cleansing cloth; again, very easily changing it to a gender neutral product which would be readily accepted and used by men and women. How important are onboard amenities and amenity kits when it comes to realizing the journey in the cabin as a complete sensorial experience? It would be my dream come true if all airlines adopted the approach of using onboard amenities and kits for sensorial purposes. Often, they are held back by budget restrictions, as it’s seen as unattainable, but airlines don’t realize that small, cost-effective changes exist and can have a big impact. It can be a really simple gesture such as spraying a fragrance in the cabin just before the lights turn off to evoke a restful night’s sleep. This can be easily translated into the kits also, by adding a bottle of the same fragrance. Passengers can then use it in their hotel room and still evoke the same restfulness they enjoyed on their flight. What are little boys made of? Snips and snails And puppy-dogs’ tails. What are little girls made of? However, in today’s modern world, more and more parents are allowing children to make their own choices of likes and dislikes irrespective of gender, which to me sounds refreshing and far more creative. After all, I sure know Barbies were not for me, and I would always be found in the garden building a fortress out of anything I could get my hands on, or, more amusingly, dragging our dogs into our run-down jeep and pretending I was Lara Croft on a mission. Allow me to reassure you that this isn’t just about limitations placed on girls. Boys may prefer to be a princess rather than a pirate and, I say, why not? As long as you do it fabulously, darling! The question is: When it comes to providing amenity kits that both delight and entertain their younger passengers, do airlines have a responsibility to do so without making influential choices on gender stereotyping? have a happy balance of feminine and masculine characteristics. A great example of this is Singapore Airline’s children’s kit from 2016, featuring the popular children’s movie, Zootopia. The story follows an unexpected friendship between Judy Hopps, an ambitious rabbit who strives to be taken seriously on the police force by solving her first case, and Nick Wilde, a wily fox that dabbles in petty crime, who once had similar ideals to Judy but they were crushed as a child, when he was bullied and muzzled at ranger scouts, as ‘no-one could ever trust a fox’. This choice of license, whether consciously or not, is breaking boundaries. Not only is it serving its primary function to entertain whilst also encouraging children to follow their dreams, but it also subtly addresses topics of gender bias, sexism, racism and xenophobia. Now, of course children don’t read into all of this, unless you’ve raised a genius, nevertheless these decisions are crucial when it comes to an airline’s responsibility in reflecting societal evolution. Why You Should Visit Our Stand Amenities takes a closer look at who will be exhibiting their new amenity concepts and offerings at this year’s 2018 WTCE. BAYART – STAND 4E 100 Bayart Innovations is very excited to introduce its new amenity kit for business cabins. The pouch contains a pair of socks, earplugs, an eyemask, a mirror, a shoe horn, a toothbrush, a pair of earphones, and an earphone holder. It is designed to be kept post-flight and even used as an evening clutch. The bag is made from polyurethane (smooth outside, and grainy inside) and smart as done in one piece of fabric (no sewing) for high quality finishing. AK SERVICES – STAND 4E 73 AK-Services group of companies is the largest manufacturer and supplier of In-Flight products in Russia and abroad, with more than 20 years of experience. AK-Services provides the full range of onboard service production: amenity kits for passengers of all classes and ages focused on quality, great design, upto-date IT technologies including AR&VR, and closed partnership with worldknown travel-oriented brands. Our team has the unique product expertise with its own design studio, IT specialists, manufacturing and product facilities in Saint Petersburg that are certified to meet all the international requirements, the efficient logistics and own vehicle fleet. We set the highest standards of kids’ travel kits composed of endless varieties of components working with famous recognizable brands unique to the industry and making the kids’ onboard and post flight experience vibrant and valued. We are ready to offer the best solutions, the unique ideas and low prices to meet the most daring wishes of every customer. AK-Services is focused on opportunities provided by virtual and augmented reality, allowing to level up amenity kits for adult passengers and children, and make habitual things even more interesting and exciting. It is our first exhibition and we are definitely ready to present the new wonderful products you can’t find at any other stands. The newest and bravest solutions for your business, old classic products in new styles and the best mobile technologies for amenities! Visit AK-Service at stand No.4E73 (Hall A4) and try it all by yourself! skysupply – STAND 4D 30 skysupply – is a leading provider of comfort items to the on board services sector. We are an award-winning global company with over 25years experience in developing individual concepts and products with the highest level of functionality and appeal. Our broad portfolio covers all the in cabin requirements such as amenity-kits, overnight-kits, blankets, pyjamas, slippers, toys, headsets, plastic rotables, kids sets and games etc. skysupply is innovative, professional, creative, dynamic and intelligent and offers co-branding opportunities for a number of cosmetic and fashion labels to profile their products to a new global audience above the clouds. At skysupply we listen very carefully and we develop solutions which embrace sustainability and protect our precious environment and present ideas which reflect the vision and mission of your airline brand. Our attention to detail and functionality is also defined by creating and developing kits which can be used long after the flight experience and some go on to become special and sought after collector items and underline the added value of our creative work. Please give us some of your valuable time to tell you more about us and come visit us on Stand 4D30 - and we will do our very best to create tailor-made items for your passengers to cherish and remember you by time after time. ALBEA – STAND 1A 50 Because Albea are exploding with creativity! We have a unique approach to invent tailormade solutions that reflects the values and the DNA of our customers in line with the latest fashion, lifestyle and beauty trends. We have been serving leading airlines for 13 years. Visit us on booth 1A50! WESSCO – STAND 1B 10 With 35+ years in the industry, WESSCO is the creative partner of choice for the world’s leading airlines, hotels, and cruise lines. Our mission is to create onboard and in-room service programs that enhance the traveller journey and drive increased satisfaction and loyalty for our travel partners. At WTCE 2018, we will be unveiling our new range of products and unique collaborations featuring fashion and lifestyle brands, cutting-edge skincare, luxurious bedding, and premium fragrance brands to match a wide range of onboard programs. Email info@wessco.net to schedule a meeting and explore how we can help you create a memorable passenger experience. KAELIS – STAND 4E 11 Kaelis is the world’s leading independent provider of on-board products, services and solutions, serving 1 billion passengers from more than 100 airlines and railway companies in more than 50 countries, with an experience of more than 20 years contributing to customers’ success. The multinational company specializes in: sourcing, designing, developing, manufacturing and delivering products worldwide as well as providing consulting services for on-board services. Kaelis was founded in 1997. Over the years, Kaelis has enhanced its global footprint by opening several offices around the world. Kaelis has been participating in many amenity tenders in the past three years and it has been recently awarded Air Astana Economy Amenity Kit and Royal Air Maroc Business Amenity Kit. During this period, Kaelis is growing the number of fashion and cosmetic brands partnerships. GALILEO WATERMARK – STAND 4C 60 Following a successful first year as the newly merged Galileo Watermark, we are excited to have the opportunity to showcase a number of new and exciting product developments on our stand. We will be showcasing OCN, our cosmetic line made with ocean recycled plastic, a first in our industry, as well as a number of exciting new brand partnerships across multiple categories. In addition to this and as part of Galileo Watermark’s drive to invest in innovative, industry-leading initiatives, we’re also excited to offer our guests and partners an opportunity to experience what the future of aviation travel might offer. Our teams have been hard at work to deliver a completely immersive virtual reality experience from the comfort of our stand: by strapping on our VR headset, you’ll be transported to a bespoke cabin experience, where you’ll be able to interact with our product at 35,000 feet, without the hassles of customs, immigration, or baggage weight restrictions. More than just being able to interact with objects, we are excited to delve into the potential of VR as a potent design, marketing and presentation tool for our valued partners. If you’d like to know more about our vision for the future and what it means for your guests, as well as see a whole host of innovation, make sure to come visit us at stand 4C60 for a truly remarkable experience.